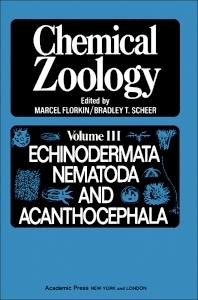 Chemical Zoology, Volume III: Echinodermata, Nematoda, and Acanthocephala presents chemical information on zoological significance of Echinodermata, Nematoda, and Acanthocephala. This book is divided into two sections; each section deals with the biological and biochemical aspects of the specific phylum. The first section examines the general characteristics, ionic patterns, feeding, nutrition, digestion, carbohydrate and lipid metabolism, fertilization and development, and pharmacology of Echinodermata. The echinoderms make up one of the principal branches of the animal kingdom and one of the most distinctive. The second part focuses on various aspects of nematodes and Acanthocephala, including their classification, skeletal structure, nutrition, and culture methods. The carbohydrate and lipid metabolism, lipid and nitrogenous composition, osmotic and ionic regulation, growth and development, pigments, and pharmacological activity of nematodes and Acanthocephala are also discussed in this volume. This book is an invaluable resource for zoologists and biochemists.